Dump, dedump, dedump dedump dedump, deee-dump deee-duuuummmp. The37-cent Henry Mancini commemorative stamp was issued on April 13, 2004, in Los Angeles, California. 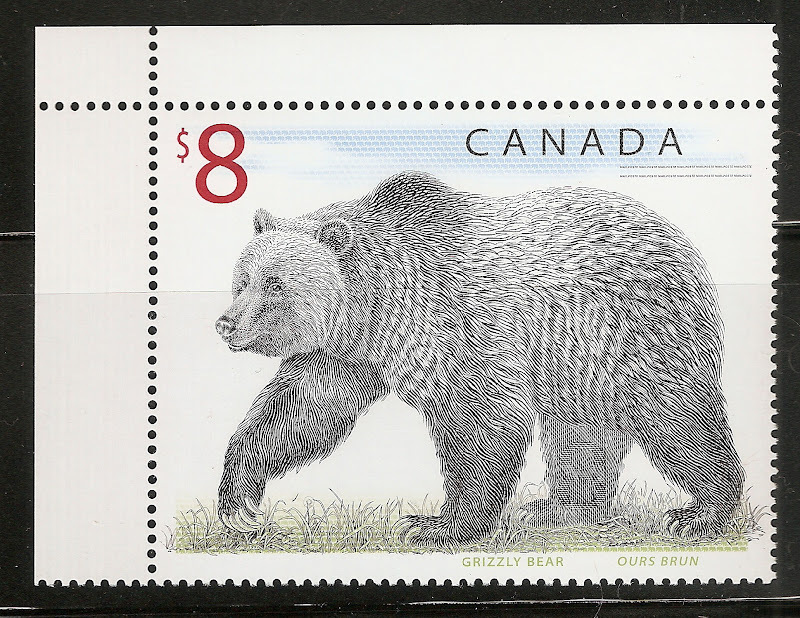 Carl T. Herrman of Carlsbad, California, designed the stamp. The stamp honors Henry Mancini, one of the most successful music composers in the history of television and film as well as a popular pianist and concert conductor. Mancini left a rich legacy of catchy television themes, hit songs, and unforgettable film scores, such as "Peter Gunn," "Moon River," and "The Pink Panther," respectively. He won many awards, including twenty Grammys and four Oscars, and his albums have sold more than 30 million copies. 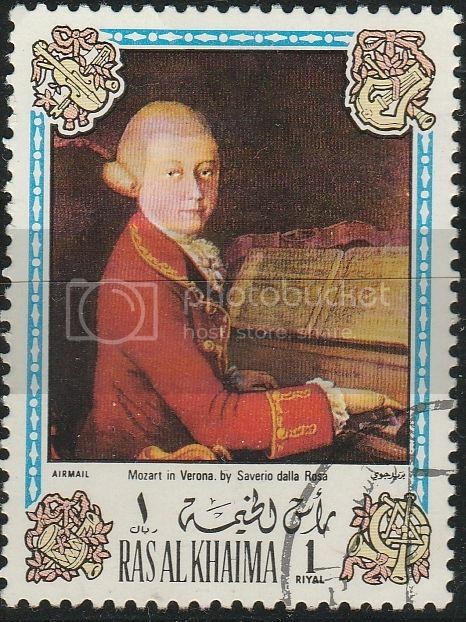 The stamp features a painting by artist Victor Stabin showing Mancini conducting as the titles of some of his most popular film and television projects appear to scroll over a screen behind him. An image of the Pink Panther in the lower left is a further reminder of one of Mancini's popular works. Sennett Security Products printed 80 million stamps in the gravure process. It is a self-adhesive stamp with a serpentine die cut of 10-3/4 perforation. 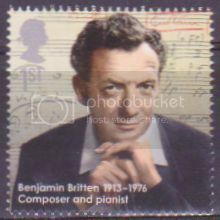 Last year, 2013, was the 100th anniversary of the birth of Benjamin Britten. Here is a UK stamp issued to commemorate this. 1999 was the 150th anniversary of the death of Chopin. Here is a French Polynesia stamp of that year. 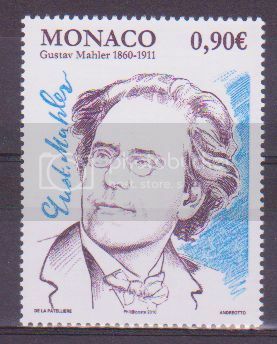 Mahler in Monaco, for the centenary of his death. The Turkey Europa issue for 1985. Handel and Domenico Scarlatti at the top; J S Bach and Itri at the bottom. If like me you didn't know who Itri was, he was a Turkish composer who lived from 1640 to 1712 who set his own verses to music. Only some 40 of over 1000 works survive. UNESCO declared 2012, the 300th anniversary of his death, International Itri Year. 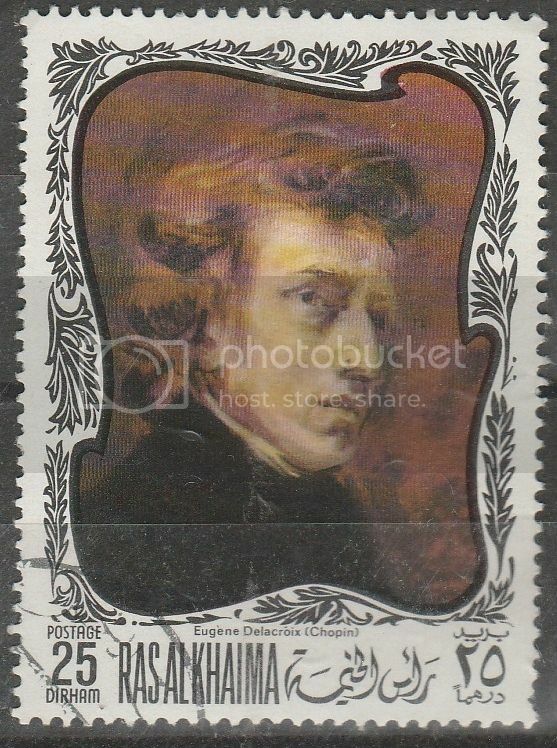 On Oct 26th, 1941, Bohemia and Moravia issued a set of semi-postal stamps to commemorate the 150th anniversary of the death of Wolfgang Amadeus Mozart (1756-1791). 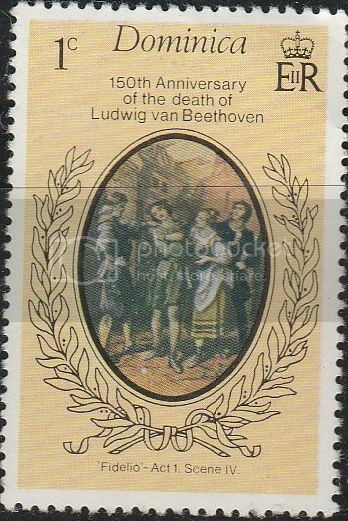 There were 4 stamps in the set, these two feature a portrait of Mozart while the others depict the Old Theater in Prague. 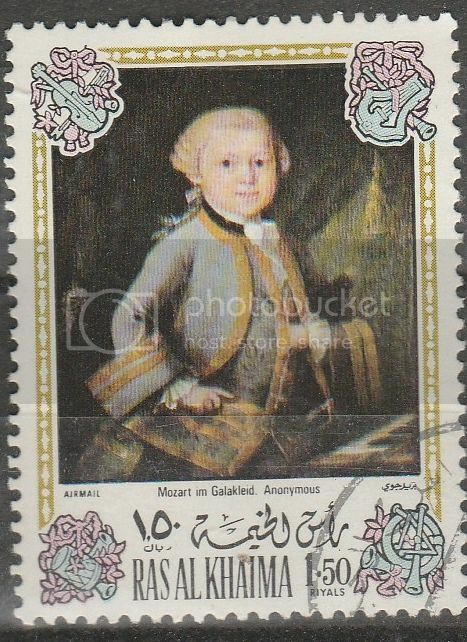 The stamps in this set also were accompanied by labels, these feature Mozart's piano. 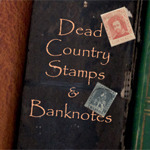 The surtax from the stamps went to the German Red Cross. 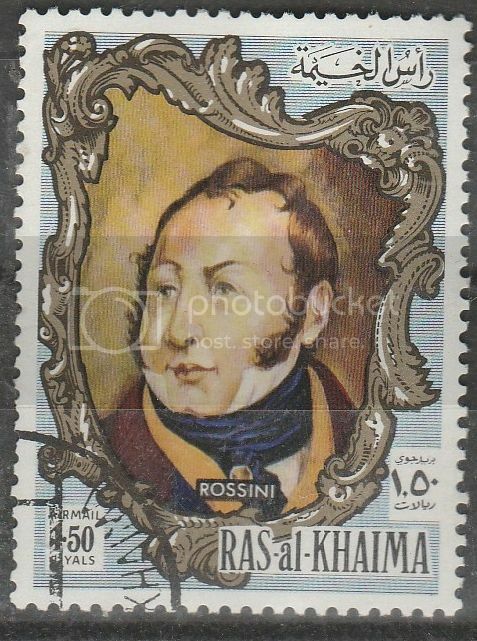 On May 22nd, 1943, Bohemia issued a three stamp set commemorating the 130th anniversary of the birth of Richard Wagner (1813-1883). Wagner was known to be Hitler's favorite composer. 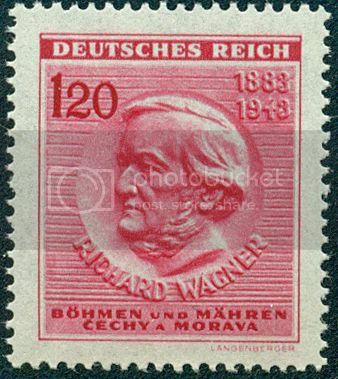 This stamp features a profile of Wagner while the others feature scenes from Wagner's operas. 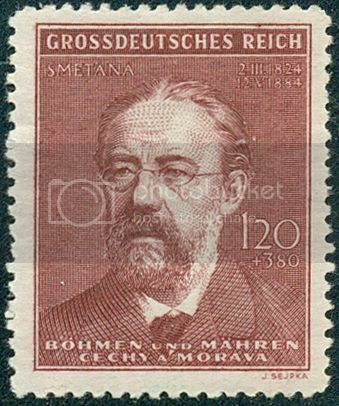 On May 12th, 1944, Bohemia and Moravia issued a set of two semi-postal stamps commemorating the 60th anniversary of the death of Bedrich Smetana (1824-1884), a Czech composer and pianist. The surcharge went to the German War Effort. Here is a 1985 Miniature Sheet from East Germany showing three of the greatest composers of the 17th and 18th centuries with some of their music: Johann Sebastian Bach, Handel and Schutz. Schutz is probably the least well-known of these. He composed lots of organ and choral music, and also what was probably the first German opera, Dafne (1627), the music for which has not survived. Interestingly all three composers are venerated as saints in the calendar of the Lutheran Church, because of the large amount of sacred music they wrote: they have a joint saints' day on 28 July. 1985 was a bumper year for music stamps. 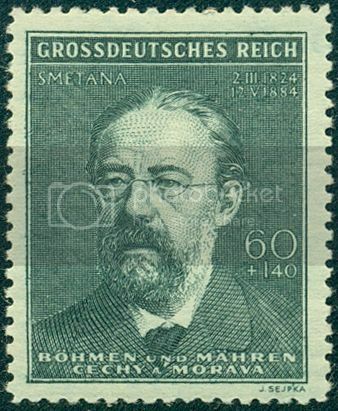 Bulgaria issued a set of 6 featuring composers. here are three of them - J S Bach, Mozart and Tchaikovsky. Here are the remaining three composers in the 1985 Bulgarian set: Verdi, Mussorgsky and Filip Kutev. Kutev lived from 1903 to 1982. 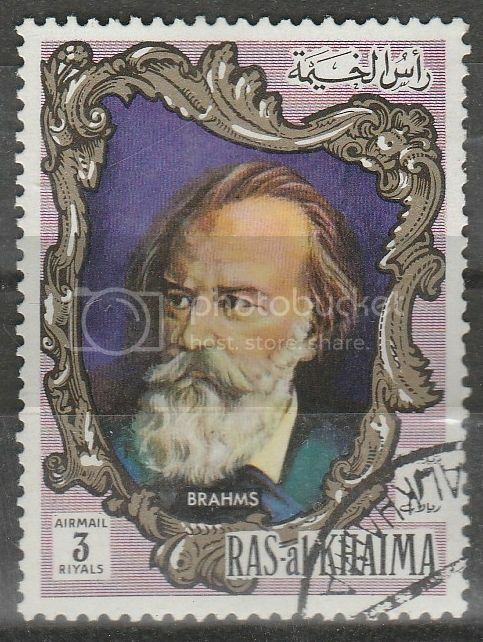 He did much to establish a new tradition of choral music in Bulgaria; and also founded an ensemble which played his settings of folk tunes in which - like, for example, Vaughan Williams in England - he fused elements from folk music with elements from classical music.